Blogger Buster: Tagnetic Poetry for Blogger? 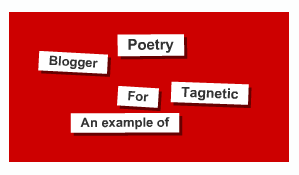 Here's something interesting I've been working on lately: a "Tagnetic Poetry" widget/add-on for Blogger. Based on Roy Tanck's Tagnetic Poetry plugin for Wordpress, this widget can be used to add interesting stylized links for label pages or other interesting posts. It uses Flash to create and display the links and their titles, and chooses a different layout each time the page is reloaded. Try refreshing this page and you'll see how this works. Ideally, this widget needs lots of space and short labels/titles to display properly. The script will not display lengthy tags unless there is enough room for them to be rendered properly, so where many tags are displayed, one or two tags may be missing. I understand that many of you would like to install a tag board like this in your template, so I am working on an installable widget/gadget which will enable you to add this to your layout or within a post page. Thanks to Roy Tanck, upon whose hard work this Tagnetic Poetry widget is based. Don't forget to check out Blogumus - the Blogger version of his excellent WP-Cumulus plugin, and feel free to leave any comments below.